by: Steef den Draak, webmaster of Zwagers.nl. In this article I'll show you how to configure the ADSL/Cable modem/router of E-Tech for use with (for example) ADSL by KPN (MXStream). It will take you about 5 minutes to configure the router. Just like the Vigor 2200(E), this router is excellent for use with a home network. It comes with a 4 port 10/100 Mbps switch, with one port switchable to cross-connect. This cross feature is of special use when adding additional hubs or switches. After the configuration, the router will handle the dialin activities for your ADSL (MXStream) connection. 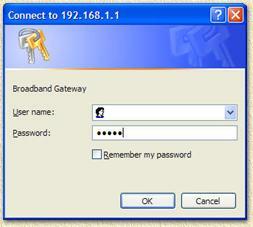 It also offers a additional firewall kind-a feature using NAT (Network Address Translation). It protects your home-network from attacks from the Internet. By the way: this is a pretty cheap router/switch: app. $190. Note: This eTech modem/router combines both MODEM and ROUTER in one device! So if you decide to use (A)DSL at home, you will only need this device! 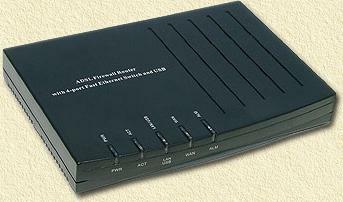 Note: This modem/router is suitable for (A)DSL over ISDN! ETech has a similar model for (A)DSL over analog/POTS which is configured similar. Tip: (thanks to Rob Staal for the tip!) ugrading the firmware is worth considering! Visit the eTech website and get the latest version! 1. What's in the box? a very brief Dutch manual (if bought in the Netherlands). For this tutorial you will only need UTP cable, router and power supply. Shows green when the powersupply provides juice. During initialization of the router, this LED is red. Once the initialization is completed. blinking green during data transfer to and from your PC(s). blinking green during data transfer within ADSL/Kabelmodem. red if alarm state is reached (something is wrong). 4 Ethernet ports numbered 4 to 1 (For connecting your PC's). 1 (A)DSL Port (for hookin' up the telephone company). Place the powersupply into the wallsocket. The ALARM will briefly go on and off. Connect the PC(s) to the routerports (1 to 4).The LINK LED will light for the matching port when a connection is OK between PC and router (only if the PC is switched on). Connect the ADSL of KPN (MXStream) Ethernetmodem to the WAN connection on the router and the "10Base T/MDI-X" connector on the Alcatel Ethernet modem ( details see ANALOG/PSTN and ISDN). The LED on the back of the Alcatel and the WAN on the router should now light up (if both devices are powered). Start a webbrowser on your PC, for example Internet Explorer, and open 192.168.1.1, a dialog will popup showing you a request for "User name" and "Password". Here the default values are: "Username" = "admin" and "Password" is empty (so do not enter a password). The quickest/easiest way to set-up: Click "WAN" aftre that "Quick Configuration"
Duplicate the settings show in the image above, for use with ADSL van KPN (MXStream) and click "APPLY". Note: do not forget to add the @-extension to your username (for example @xs4all-adsl, @adsl-comfort, @euronet.nl-1024, @zonnet-extra, etc.). Click "APPLY" once more. The router will now start connectiong to your ISP, the "Status Monitor" will show you if this works OK:You're now done configuring your router, but still have to configure the PC's (Window 2000/XP, Windows 95, 98, and ME). After doing so, start on the PC, a browser, for example Internet Explorer, and open a great website (http://www.weethet.nl/). The router LEDs will now reflect activity.Tip: remove any dialup adapter on your PC and configure Internet Explorer to use LAN only!